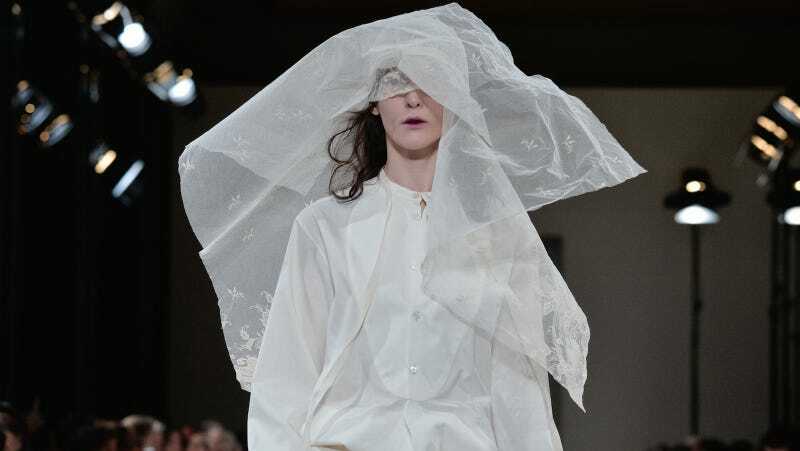 The skewed headgear presented at Ann Demeulemeester in Paris today were more than the sum of their parts, which evoked birds in a flurry, ghosts in mid-haunt, brides interrupted, the dark underbelly of paintings by Vermeer. Paired with loose, bold separates in silk and leather, emphasized with above-the-elbow gloves, the construction of them accomplished a rare and jarring emotion, an unloosed beauty also meant to make you uncomfortable. Of the veils, creative director Sébastien Meunier told Vogue, “This is a very romantic girl who mixes all her lace and old garments. She wants to go and party, but in a different mood.” Looked at another way, though—and perhaps from a distinctly American perspective—Meunier’s goth queens are less late-night provocateurs and more of a cautionary tale, the aftermath of marginalization in a culture that increasingly devalues women. The Vermeer allusion is not all that no-duh when the politics of the 1600s are about where we seem headed today. And the specters of the veils paired with the beauty looks—purpled inner lips and nothing else—added a severity to the moment, a reminder of how even in fineries a woman’s spirit can be squashed. Is it overthinking? There’s a power in it, perhaps, but it also a sense of crawling in on one’s self, rather than outside of it; the strongest looks were the leathers, which seemed to project a different image, something assertive rather than shrinking. All of them, though, seemed to come back to haunt their oppressors.